A shop in Toronto's renovated Union Station. Toronto’s Union Station has been under construction since 2009, and the massive revitalization project is finally bearing fruit. Below its main hall, a refreshing collection of thoughtfully designed shops is making visitors rethink the landmark as a place to visit and not just race through to make the train home. Known as the Front Street Promenade, the lower level is the new home of a handful of local and independent retailers and restaurants. 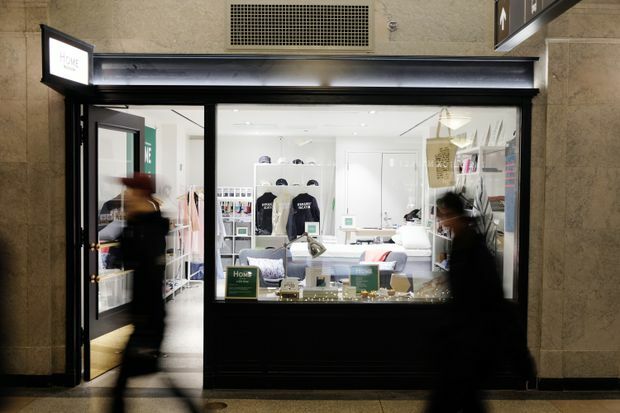 Shops include Peace Collective, which makes Toronto-centric casual apparel and has stores on Ossington Avenue and at Square One, and The Detox Market, a Los Angeles-based beauty boutique with locations on King Street West and in Yorkville. There’s also Union Spaces, a dedicated pop-up area that’s already hosted chocolates and succulents, and Naked Beauty Bar, a nail, waxing and lash salon hailing from Dundas Street West. In addition to retail, the food and beverage offerings include Pilot Coffee Roasters, Calii Love, Danish Pastry House, Greenhouse Juice and Forno Cultura, which opened its biscotteria concept on April 23. Further west in the York Street Promenade are restaurants Amano and Union Chicken. Future retail developments include a fresh-food market and an oyster bar in the Great Hall, along with a traditional food court and a selection of big name retailers. “It is a deliberate move away from the cookie-cutter chains to create a sense of place for the over 300,000 people who pass through the station daily,” says Vanessa McDonald, vice-president of brand strategy and partnerships at Osmington, the property’s lease holder. “Our goal is to curate a multifunctional must-see standalone destination with the best retail, service and restaurant operators in the city.” To select the vendors, Osmington partnered with Beauleigh Retail Consultants. Regina-based jeweller Hillberg & Berk is opening a new flagship location at Edmonton’s Southgate Centre on April 28. Its eighth retail location sits at 850 square feet and was designed with design firm Cite360 Studio and builder PCL to create a hands-on, welcoming environment. For more information, visit hillbergandberk.com. This Saturday, April 28, from 1:30 p.m. to 2:20 p.m., join American photographer Erik Madigan Heck as he discusses his exhibition Old Future. The regular contributor to New York Magazine, Vanity Fair and Harper’s Bazaar will be at the Nicholas Metivier Gallery as part of Toronto’s annual Scotiabank Contact Photography Festival. For more information, visit scotiabankcontactphoto.com. Canadian fashion pop-up Inland is back in Toronto for its spring 2018 edition. From April 27 to 28 at 134 Peter St., shop a curated mix of locally made clothing and accessories and meet the designers behind the brands. Admission is free. For more information, visit madeinland.ca.